Just decide it by say top 10 in MVP voting consistently or all NBA team selections. Getting people to vote to decide whether you get extra money would be silly lol. Durant was apparently blown away by the Clips presentation. I said that's where I would go a few weeks back. lmao your dumbass believing everything you hear on twitter. It's either Dubs or he's staying. There's no other realistic option. Everyone knows that Celtics are going use imaginary picks and assets to trade for two more all stars and he'll join tbh. I think he's staying anyway, think he genuinely is intrigued by Boston but as much as i like Al Horford it's not enough. What big 4 they'd have to trade Blake to get him? He wants to win chips not be a dumbass like you and choose that over Dubs. Hell he's got a better team in OKC than Clippers. Why go team up with a bunch of frauds in Golden State when he can go play with a better PG, PF and C in LA? They couldn't do that. Their cap wouldn't allow it. Could not keep CP3, Blake, DJ, and sign Durant for close to the amount he's looking for. They would have to get rid of some players, including Reddick. He will resign with OKC and probably leave next year its looking like though. This is most cowardly free agency decision I've ever witnessed. It's not even close. Congrats to Warriors fans for rigging the game though. Lock it down it's done. No point even watching the game tbh. The positive thing is that we get to watch Westbrook play with more rage than he normally does now. I'm not sure he'll survive this season. Before my granddad was put in an internment camp he lived in Oakland. Moms was born there too. Looks like I got a new team. Won't happen, they were 3-1 up with Harrison Barnes missing every *bleep* shot that now KD is going to take with Green getting himself suspended. Anyone that thinks that they are not going to cakewalk to a title are fooling themselves. IF Lebron beats the Warriors WITH KD, they need to immediately change the NBA logo to Lebron's tomahawk dunk. If they stay healthy that is. Would be great if everyone were injured. I'd shed tears of joy. Karma needs to show up for this. Oh it'll be fun seeing KD the villain though Finally, Lebron is 100% off the hook for his "Decision" to play in the 305. 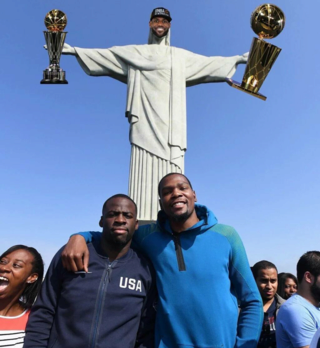 KD just inherited the villain title. The Warriors are going to be sooooo hated Not like it matters that they're hated but it'll be fun to watch. How do you even stop them on 2K now? They were already a cheat team to play with. Smfh! Well naturally any debate you have in Sports is under the assumption people are healthy. If LeBron beats this team in the finals, then he's the greatest ever in my book.